On December 9, 1800, the government of the Northwest Territory authorized the creation of Fairfield County. 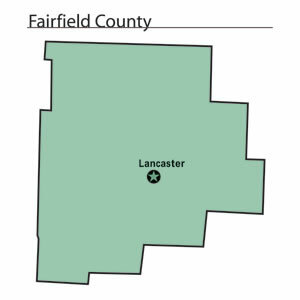 Residents named the county after the area's "fair fields." Zane's Trace passed through the county. The population grew as people moved westward into the Northwest Territory. Fairfield County is located in east central Ohio. It is predominantly rural, with less than two percent of the county's 505 square miles consisting of urban areas. The county seat is Lancaster. With a population of 35,335 people, Lancaster was the county's largest community in 2000. The next largest urban area, Pickerington, had 9,737 residents in that same year. Fairfield County experienced a significant increase in population, roughly 18.6 percent, between 1990 and 2000. The total population of the county in 2000 was 122,759 people. Many of these new people were residents of Columbus or other parts of central Ohio. The county averages 243 people per square mile. The largest employers in Fairfield County are sales establishments, with health care, communications, and other service industries a distant second. Government and manufacturing positions finish third and fourth respectively. Farming is a distant fifth. During the late nineteenth and the early twentieth centuries, the county became a major producer of glass products. Anchor-Hocking Glass Company originated in Fairfield County. In 1999, the per capita income in the county was approximately 26,700 dollars, with almost seven percent of the people living in poverty. Most voters in Fairfield County claim to be independents. Among Fairfield County's more prominent residents was William Tecumseh Sherman, a general in the Union Army during the American Civil War. His brother, John Sherman, was a United States senator and author of the Sherman Anti-Trust Act. General Sherman's former home in Lancaster is now a museum. Ohio Governor William Medill was from Fairfield County. Tarlton Indian Mound, the only known cross-shaped earthworks, is in this county.